Authorities are currently investigating after a mysterious bird incident that took place in BC. On Friday, September 14, witnesses were shocked to see a group of birds plummet and hit the ground. The incident took place in Tsawwassen, BC, specifically near the ferry terminals. Environment and Climate Change Canada (ECCC) explained in a statement that 42 starlings had died in what they're describing as a "mortality incident." Enforcement officers have collected the deceased animals and are currently in the process of getting them to an animal health lab for a post-mortem examination. Marilyne Lavoie of the ECCC comments that they'll "need to conduct a necropsy to ascertain [the] cause of death," and that "a preliminary diagnosis will be available in the coming weeks." 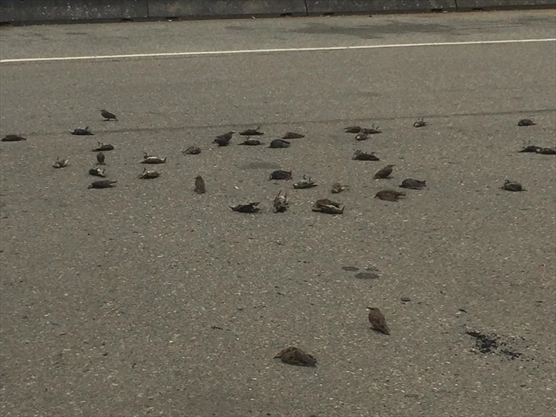 Laurie Wilson, Environment Canada, also shares that there was some difficulty finding the corpses after "someone moved the birds and pushed them off to the side of the road." "We've heard reports of birds falling dead out of the sky or of multiple bird mortalities, but it's definitely a rare occurrence. We really can't speculate on the cause of death until the results come back in." Kev Beech managed to capture a photo of the chilling event, which has since been shared on Facebook over 400 times. He explains in the comments that some of the birds were "still alive and crawling around with broken wings and legs." It remains unknown whether any of the birds had died mid-flight or after falling to the ground.